Writing a great novel doesn't just happen, it is designed. It is thought out. It takes a writer who has discipline, creativity and open-mindedness. You also need a place for organization as well as a place to write. StoryMill is both. Take your idea for mystery, romance, adventure, action or science fiction and turn it into that novel you know is within but just needs a little help getting out. Developed to ease a person into the writing experience, StoryMill is purposely designed to include all the elements essential to writing as well as providing a place for organizing all the other parts and pieces. 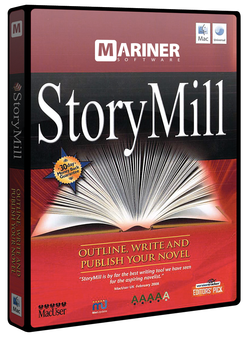 StoryMill is incredibly flexible - use it as your place to write and revise using its distraction-free full screen and powerful annotations, or as your place to organize every character, location, and scene that makes up your novel. You can set a daily writing goal and keep track of it using the Progress Meter. There are handy things to help you keep track of clichés and monitor how many times you use a word. There’s a single place for all your research – add pictures, tags, files and links, or make notes to any item in your project. It’s all right there within easy reach. Monitoring time and dates of scenes and events is critical to writing. With the Timeline feature that is exclusive to StoryMill, you can group the scenes so you can see the relationship between them. Change the unit of time measurement all the way from minutes to centuries. Insert scenes or events and view the list of untimed scenes. No matter what passage of time your story takes, the Timeline View will give you a perspective unique only to StoryMill. The Snapshot feature eases the editing process. Go to any scene or chapter and take a snapshot of your work. You can then view two versions of your writing, make edits and revisions in one so you can compare it to the other. If you like what you see you can keep or go back to the original. One of StoryMill’s best features is the Full Screen Mode, providing you with a clean, distraction-free writing landscape. No background apps, no menu bar - not even email - just you focusing on your novel. Pick any color background and any color type - even determine your margins - either way, your eyes will thank you for it.